You may go about your life without knowing that a pipe has been damaged. Wherever the damage is, it will most likely get worse and more expensive to repair as time passes. We want to save you from the time and costly expense of unknown leaks and damage by inspecting your pipes regularly to see if your system needs pipe repairs or replacements. If you observe any of these or other suspicious signs of damage in your home or business, it is worth inspecting your pipes. We have the expertise to fix your problems, whatever they may be. People wonder what might be happening inside the pipe, especially because space and light are very limited. Our video camera line inspection helps us see exactly what we’re dealing with when it comes to pipe damage. No need to guess what might be happening because we can identify all types of problems including buildup, leaks and obstructions. Pipes are made of brass, copper and steel, and drain lines are made of iron or polyvinyl chloride. We’ll inspect, repair and do our best to prevent the same problems from occurring again. However, we understand that it may be better for your home or business goals to do a pipe replacement instead. Depending on your pipe situation, it may be wise to reline your pipes. There are various methods to reline pipes, and our licensed plumbers will inspect your pipes and assess the scope of the project to determine which method is best for your system. Since pipes often run underground — under lawns, gardens, patios or driveways — the pipe repair process can be a costly expense. Tools, such as jackhammers and backhoes, will be necessary when trying to access the pipes, which can add to the cost. Speak with our technicians to get the best prices to repair your damaged pipes. At Vines, we have over 36 years of experience dealing with all types of pipe issues. 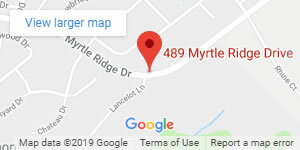 Whether you need service for your home or business, contact us today at (843) 258-5677 to get pipe repair and replacement services in Myrtle Beach.